You really impressed Me by How beautifully You explained this.. But yet I haven't found an answer for 'what will You call a system whose past output depends upon the present input?' I know this system too is not physically realizable but mathematically, it is. Example: when x being the input system gives y output and is described by the difference equation y(n-1)=x(n).. In this case if present discrete time is n=1 then for input x(1) at present time n=1 will give output y(0) which represents past with respect to n=1.. Usually the books keeps this in non-causal category but without any explanation.. Thank u sir.This information is found in none of our textbooks. Good to know that this helped you. 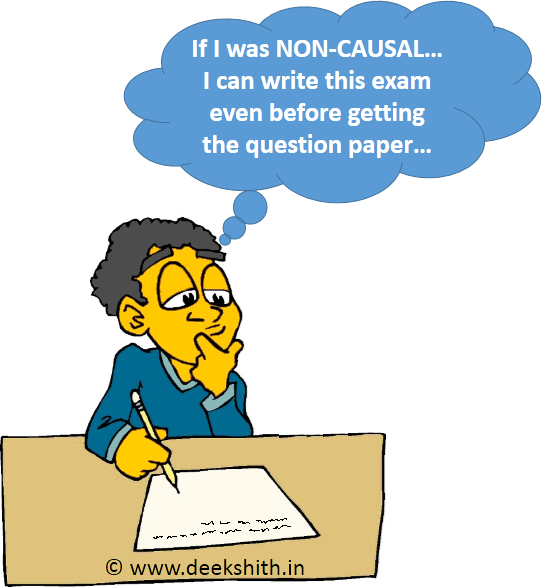 is y(t)=x(t)cos(t+1) casual or non casual ??? after reading just mathematical defininitions in the textbooks i was really looking for some physical meaaning!Thank u so much! Good to hear this from you.